For more information on how to apply to Fightback Grassroots Promoter, visit www.musicplanetlive.com to create an account, then email Music Venue Trust at [email protected] for more details. With 2017 coming to an end, it's only natural to gear up for some of the most anticipated tours coming to our cities in 2018. Although some of us might want to close the door on 2017 and never look back, 2017 was a year for some of the best tours in the music industry. From saying goodbye to Tom Petty to breaking our necks at a Metallica concert - here are a few notable tours of 2017 we won't ever forget. Petty seemed overjoyed to be on stage, especially performing at his hometown show. The band performed their 1985 hit “Don’t Come Around Here No More,” an all-time Heartbreakers song during the band’s career. The band’s members consisted of keyboardist Benmont Tench, bassist Ron Blair, guitarist Mike Campbell, and 24-year old addition drummer Steve Ferrone. Lighting designer/director and set designer Stanley A. Green upped the ante with the show’s 160 winch balls or orbs, creating an immersive effect on stage, according to PLSN. Technical director Kevin Cassidy mentioned Tom Petty’s humorous desire to feel like he’s inside of a lava lamp. Petty went bigger with his last tour with video screens, including a 60 foot wide LED screen filled with minimal I-Mag video content and London-based Treatment Visual Productions, all programmed by Green, PLSN reported. The huge backdrop combined with the color-changing orbs lit up the stage for his very last tour in history. U2 revived its 1987 The Joshua Tree album, the band’s fifth album, with a concept relying on nostalgia but also complete relevance in wake of the 2016 election. The album was written during the Reagan-Thatcher era of British and U.S. policies, including Thatcher trying to put down a miners’ strike, wrote Sarah Larson of The New Yorker. Roger Waters is another artist who had touched on social justice-themed tour earlier this year. U2 felt their 1987 album became more relevant than it would have 3-4 years ago, Bono told Rolling Stone. And, the 50-show tour was a major hit, earning a whopping $316 million with more than 2.5 million tickets sold, Billboard reported. The tour included fan favorites “Where the Streets Have No Name,” and “With or Without You.” Band manager Guy Oseary expressed his privilege in being a part of the epic tour, originally meant for the band to perform only one show, according to Billboard. The band went big on production, with Anton Corbijin as the photographer and film director - the band’s creative source for 30 years, wrote PLSN. U2 revamped their performance with new technologies from PRG’s Spaceframe and a 4k broadcast camera system in its 87-inch stadium design. Green Day’s epic Revolution Radio Tour showed off their first album in four years. Revolution Radio released in 2016. The pop-punk trio came back stronger than ever with 12 albums underneath their belt, with the same energy the band had brought since the beginning. Fan favorites took over the crowd, like “Holiday,” “Minority,” “Good Riddance,” and so much more, but the band played new hits “ Still Breathing,” and “Bang Bang.” Another highly political tour, Armstrong preached unity, adding rock ‘n roll can change the world in standing up to bullies, Billboard said. The band went bigger on lighting rather than video assist, which was only present on the side screens for IMAG, PLSN wrote. 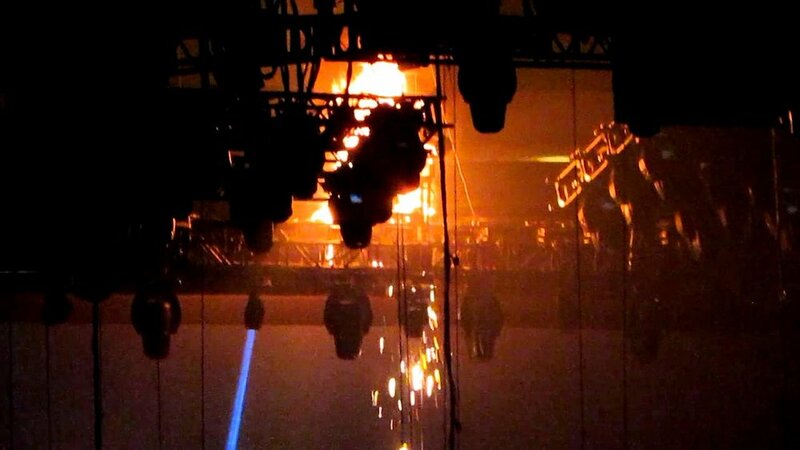 Along with lighting, designed by Ethan Weber and directed by Tommy Horton, the band wanted to incorporate pyro into a few of their songs, provided by ffp Special Effects. The band rethought drum risers and decided to incorporate 190 light bulbs into the step units, along with the circus-style Green Day marquee boasting 729 RGBW LED lamps, both fabricated by Gallagher Staging & Productions. View the full production crew here. Lighting director and designer Rob Koenig worked with show director and set designer Dan Braun to come up with a lighting design easily compatible with an 175 foot emissive video surface - one of the largest video surfaces ever used on a tour, PLSN reported. Along with lights and video, the tour called for two large inflatable balls, lasers, explosions, sparkle cannons and a fire screen spewing 300-foot comets. The ever-so-humbling Lumineers exploded back in 2013 with the folky rock ‘n roll band’s hit song “Ho Hey,” and haven’t stopped growing since. The Colorado natives’ 2017 Cleopatra World Tour - and with a great response. The Lumineers ranked No.14 on Pollstar's first quarter of the year worldwide ticket sales at $234,184. They’re up there with Green Day, Bruce Springsteen, Guns N’ Roses and more. You can feel the band’s intimate performance from any seat in the venue as they connect with the audience through Wesley Schultz's vocals, piano, acoustic guitars and tambourine led hits. The Cleopatra World Tour boasted an aesthetic Cathedral style design to match a growing audience, which means a growing space for performances. Lighting designers Sooner Routhier and Robert Long worked on creating various visuals to match the “stories” of the show - switching from acoustic songs to full-band performances, wrote PLSN. 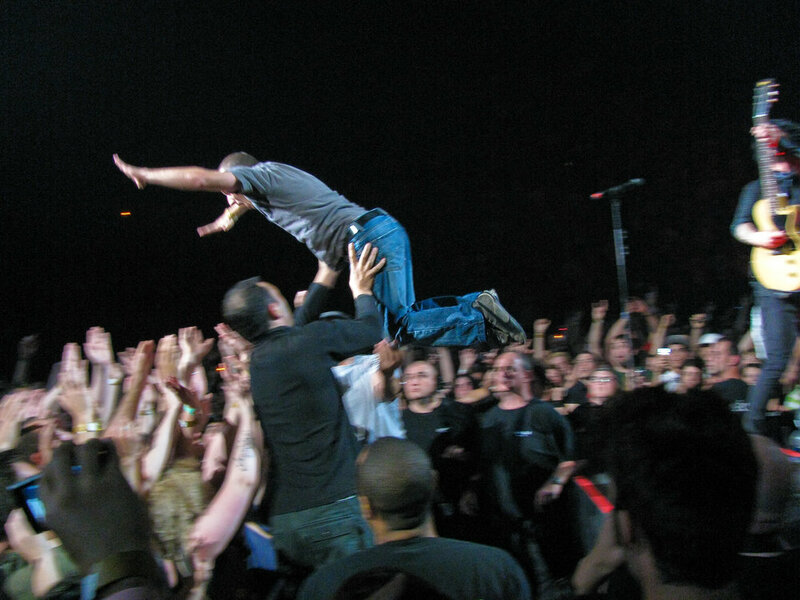 One of the best audience surprises had to be the B-Stage, where everyone in the back had a chance to literally touch the stage as if they were in the pit. After some rocky band turmoil in 2016, Guns N Roses was back and better than ever to rock their 2017 18-month tour. In fact, their three shows in November 2017 all sold out seats at the Staples Center in Los Angeles. According to LA Weekly, the band opened with another version of “It’s So Easy” before beginning their 3.5 hour long set without leaving a single hit out. Guitarist Axl Rose stole the show and kept his vocals strong throughout. Memorable and emotional moments include the band giving tribute to Glen Campbell, Malcolm Young and Chris Cornell. LDI Show 2017 is just days away, and although you may be scrambling to make those final touches and changes on your exhibitor booth, this year’s conference will hold plenty of events to blow off some steam. As a LDI 2017 badge holder, you are granted free access to entertainment on and off the LDI Show floor. By presenting your badge to gain entry into the following events, this LDI weekend in Las Vegas will surely be one for the books. This free Booth Crawl, sponsored by AV Stumpfl, Da-Lite and Live Design, includes free drinks and a scavenger hunt with a chance to win an iPad and more! When you visit these sponsored booths, be sure to take a photo of their clue and post it on one of the following social media accounts of your choice: Twitter @livedesignmag ; Facebook: /LDIShow or /livedesign; Instagram: LDITradeshow. Don’t forget to include hashtags #LDI2017 #boothcrawl and the sponsor hashtag displayed next to their booth. If you can’t picture a Vegas trip without visiting at least one club after the show, LDI makes it happen in a big way. Get your nightlife fix all weekend long and visit these clubs - be sure to present your LDI2017 badge for free entry! For more details, please visit ldishow.com. You may also download the LDI Mobile app to plan, organize and schedule your time before, during and after the show. You may search for exhibitors or sessions, browse by product category, view events by Date, Topic, or Speaker. You can even create your own schedule by adding events to your personalized schedule. On the surface, we connect with the beat, the melody, the vocals. Surely there are more reasons individuals willingly gather in one place and break all personal space barriers in hopes of getting closer to the stage. Recall the best concert experience that tops all the rest. Besides the music sounding top-notch, what else contributed to the unforgettable night? Perhaps it was singing and dancing with best friends. Maybe it was an intimate connection with your significant other. The artist touched your hand, or you swore they held eye contact with you. Right. Or, maybe it’s the night you fell in love. The gist of it is, live music connects humans in countless ways. But this can’t be done without a space. Venues are the museum to a work of art, the restaurant to a promising chef’s curated cuisine, the showroom to a designer’s new fashion line. Without them, it’s impossible to showcase the creative expression that ultimately makes our home unique. Not only do music venues hold a special place in the hearts of musicians, music lovers and venue owners themselves, but they stand as a historical pieces of treasure that reflect the city’s pop culture. The thought of our music venues being stripped from the local history is unfathomable to many. Tomorrow on October 17, 2017 marks the UK’s Music Venue Trust (MVT) Venues Day at the Ministry of Sound in London. Unfortunately, London alone has lost 35 percent of its small venues between 2007 and 2015 due to tough licensing scrutiny, planning, rising rent cost and other grievances. Toronto has seen seven venues disappear only three months into 2017, according to The National Post. Similar to London, Canada’s live music industry created Music Canada Live to build awareness of the country's venues closing. Besides property development, one point may be that millennial fans may not share the same passion for seeing small, one-act concerts. With the rapid growth of music festivals, attendees literally create lists upon lists of the acts they wish to see all in one weekend. These festivals are so popular, that according to the 2016 Nielsen’s Audience Insights Report on Music Festivals, 32 million people attend at least one music festival each year. This audience also frequently uses Spotify or other streaming services to browse new artists rather than check out a band they’ve never heard about play in a small venue. Live music discovery for them often occurs at these music festivals, such as San Francisco’s indie Noise Pop festival. When independent artists receive this opportunity, they get one chance to wow an already-present audience, potentially gain exposure and a fanbase. In turn, this makes it very hard for those smaller, independent venues to survive. According to The Rolling Stone 2010 piece “Summer Festivals Force Bands to Skip Local Venues,” the Artist Exclusivity Clause in America dictates where festival acts can or cannot play in relation to the festival’s location. For example, if Twenty One Pilots are set to perform at Coachella this year, the band can’t play anywhere near the Polo Fields during a 7-month time frame before the festival. LA’s Spaceland and The Echo talent buyer Elizabeth Garo told The Rolling Stone that April is the toughest month to book bands since the artists are committed to playing at Coachella or are waiting to hear back from them. So do we blame the millennials? Music festivals? Property developers? Streaming music services? Whatever the reason may be, large and small local venues alike need to stay on top of any threats, major or minor, that could impose on venue survival. You can read more about these steps in "How the Music Venue Business Needs to Change in 2017" on Event Brite. One of them is building awareness, like MVT actively accomplishes in the UK. Here is a roundup of some of Los Angeles’ best small music venues, that we as citizens and a city, hold the responsibility of ensuring the survival of our live music culture. With a capacity of 130, this tiny venue means a whole lot to its regular rock/punk fans with only one sole purpose in mind: the music. This venue holds true to DIY principles. It’s an all-ages, alcohol-free, and the cover charge is a mere $5. In June 2016, the owner received a demolition notice from the building’s landlord, the L&R Group of Companies, the LA Times reported last year. Young fans and artists actually gathered for a benefit where 36 bands performed to help save The Smell, bringing in $15,000, and after an online-benefit, raised a total of $24,000. The support the venue received a year ago just goes on to show how much the independent music scene means for up-and-coming artists. In fact, indie pop duo Matt & Kim played at The Smell when the duo first started out. In the Daily Bruin, Matt Johnson of the duo described his closeness with the city of Los Angeles and recalled The Smell having a warehouse vibe, not being nice, but a great venue nonetheless. This local landmark was established in 1937 known to many breakout musicians including Stevie Wonder, Willie Dixon, Natalie Cole, Ray Charles and more. Its homey vibe includes Johnny Cash paintings, display cases of Hollywood history, and a ceiling covered with vinyl records. Other notable artists who have graced this stage before reaching fame include the Wallflowers, Ben Harper and Lady Antebellum. Aside from live music, The Mint offers tapas style food and a full bar. Hotel Cafe opened in 2000 as a space for young artists moving into the spotlight. Such acts include Katy Perry, Mumford & Suns, Sia, Ed Sheeran and Lana Del Rey, according to the LA Times. Sonicbids says Hotel Cafe is a singer-songwriter’s dream venue, and perhaps this is because widely known acts such as John Mayer and Chris Martin continue to play and share the stage with rising artists within an intimate space. If you’re looking to hear the next up-and-coming rock/indie band without breaking the bank, look no further. This hipster music venue sits in the heart of Silver Lake and features new rock bands every night of the week. Formerly known as Spaceland, this venue is the home to many famous artists who were just starting out, including the Foo Fighters, Foster the People, Local Natives, Silversun Pickups and Beck. Besides rock, the venue experiments with other creative live music sets, such as indie-electronic groups perfect for the dance floor. On Mondays, The Satellite offers no cover charge, so make sure to show up early to score a table for the night. In 2006, Spaceland Presents began operating The Echoplex, home to Echo Park neighborhood. The Echoplex sits below The Echo, and is only accessible through an alley and down a flight of stairs. Like The Satellite, this venue aims to give up-and-coming artists exposure. Both the Echo and Echoplex have launched independent artists in the spotlight such as The Airborne Toxic Event and War Paint. In addition, the Rolling Stones, Nine Inch Nails, Green Day , Incubus, LCD Systems, Kendrick Lamar and several more notable artists have played here. This gem opened in 1957 as a folk club before a rock venue, and contains many defining moments in music history. Several iconic artists began at this intimate venue, including Elton John, The Eagles, Joni Mitchell, Love, Cheech and Chong, Buffalo Springfield, Billy Joel, The Byrds and more. A common word used to describe small venues is intimate. Pair that with the most excellent sound system and you'll get Troubadour. Another notable rock club on the Sunset Strip opened in 1964 and has also launched world renowned artists into the limelight such as Johnny Rivers, the Doors, and more. According to LA Weekly, the venue nowadays books new bands as well as largely known artists from time to time. Although Whisky A Go Go may not boast its go-go dancing cages from older times, the venue consists of a dance floor, balcony, two full bars and most importantly, an impressive PA. The Roxy Theatre is another independently operated venue with Goldenvoice in charge of booking shows. In 1973, Lou Adler, Elmer Valentine and original partners David Geffen, Elliot Roberts and Peter Ashen opened the theatre in response to venue mistreatment of artists. In hopes to make artists feel comfortable, Starting out as venue showing mostly comedians, The Roxy has grown into both a place for aspiring and well-known artists alike. Notable artists who are connected to this venue include John Lennon, Alice Cooper, Neil Young, and the Ramone’s first California gig occurred here in 1976. A venue with history, high quality sound and intimacy, guests should arrive early to secure a good spot. Another theatre operated by Goldenvoice, El Rey Theatre opened in 1936 as a movie house until it became a live music venue in 1994. According to its website, the El Rey is a registered Historic-Cultural Monument with its magnificent staircases, art deco lobby, facade, VIP balcony lounge and stage positioned in the grand ballroom. The Fonda was originally built as a 1920’s venue called Carter De Haven’s Music Box, and was known as The Henry Fonda Theatre and The Music Box. Reopened in 2012 and currently operated by Goldenvoice, this classic venue contains a theatrical performance room and a projection screen on the rooftop bar. Live Nation operates The Wiltern, designed in 1931 as the Warner Brothers Western Theater boasting its original, elegant design including murals stretching to its ceilings and intricate tile work, true to its time. On two separate occasions, locals rescued demolition notices in the late 1970s, and creating a first victory for the Los Angeles Conservancy in protecting architectural monuments. THE LAS VEGAS SHOOTING: How Will the Live Music Industry Respond? “Pray for Paris,” “Pray for Manchester," “Pray for Orlando," and now, “Pray for Las Vegas”. The slogans ring all too familiar, and prior to each event, all unprecedented. Of course, none of these attacks were linked together in relation to the shooter, motive, nor region. The Bataclan attack was part of a series of coordinated Paris terrorist attacks on November 13, 2015, where 89 of the 130 killed were attending the Eagles of Death Metal concert. On May 22, 2016, 22-year old Salman Abedi bombed the outside foyer of an Ariana Grande concert, killing 22 and injuring 116. The terrorist attack on Pulse Nighclub in Orlando, Florida, hit closer to home for Americans when 29-year old Omar Mateen killed 49 people and injured 58 in the deadliest hate crime against the LGTBQ+ community and deadliest U.S. mass shooting at the time. The 2017 Las Vegas Strip Shooting, or the Route 91 Harvest country music festival shooting, took Pulse’s spot when 64-year old Stephen Paddock opened fire from the 32nd floor of the Mandalay Bay Resort and Casino, overlooking the crowd of 22,000 concertgoers. On October 2, 2017, Paddock fired shots for ten minutes, killing 58 and injuring 530 innocent people. The only thing that connects these events together are the events themselves. We attend music events to celebrate music, life and loved ones. We put aside about our troubles, disagreements and hardships in our lives for a few hours, or sometimes a few days at a festival, to unite in the form of music. Live Nation, the same promoter for the Ariana Grande concert where the Manchester attack occurred, has promoted Route 91 Harvest Festival in Las Vegas for four years. On Monday, the company issued a heartfelt statement regarding support to victims and their families following the aftermath of the horrendous tragedy. The statement also thanks first responders and other employees. Each of these events then questions the effectiveness of security. How do we secure the inside? How do we secure in the perimeter? And now, an even more frightening question: How do we secure an aerial attack several football fields away and 32 stories high? There are two areas to focus on. First, how do we prevent individuals from transporting several boxes of high-power ammunition into an upper-level hotel room? And how do we protect innocent concertgoers on the ground from the external danger? Regarding hotel security, none of the hotel employees noticed anything out of the ordinary in Paddock’s hotel room or behavior. In fact, Steven Adelman, vice president of the Event Safety Alliance, said “[Paddock] would have eluded attention anywhere,” CBS reported on Tuesday. He added that the only sure-fire way to prevent weapons entering hotels would require impractical airport-style surveillance. Mac Segal, head of Hotel and Fixed Site Security Consulting at AS Solution, told USA Today that hotel security would never anticipate this type of attack. When something this devastating occurs due to the threat external to the facility, event promoters find it more difficult than ever, if not impossible, to predict or take account for what is going on outside of your facility. “The venue, Live Nation, and the various promoters are all focused on securing the facility. This threat was external - via the hotel, where they have no jurisdiction or operational control or ability to manipulate the variables around security…” said Chris Robinette, CEO of Prevent Advisors, a security consulting company, Variety reported. Therefore, this type of attack calls for large outdoor event organizers to observe event regulation in regards to evacuation procedures and the event location, such as events next to high-rise hotels. Standing room festival seating easily sparks chaos in response to a disaster such as this. “There are no aisles, no direction and the crowd density is high. A lot of people are all leaving at once, they can’t find a way out and there is no one to give direction,” said Paul Wertheimer, head of Crowd Management Strategies, to USA Today. Segal added the lack of pre recorded announcement at Route 91 Festival accounted for much of the confusion for the attendees in regards to some kind of direction on where to evacuate. All of these questions are seemingly becoming the new norm for security professionals, event venues and event promoters. Robinette urges that working with law enforcement officials in the area of the event and security professionals in surrounding buildings must both have a plan to respond to any catastrophic event. Living in a world where we cannot prevent or predict every threat may be the inevitable. As for concertgoers, music brings people together in joy. Whether or not these events stop people from obtaining that joy, our law enforcement and security officials must put disaster plans into place now more than ever. With all four senseless tragedies that are difficult to understand -- Manchester, Paris, Orlando and Las Vegas -- the one thing we know we can act on, is to be prepared. On August 25, 2017, Hurricane Harvey hit the Texas coast, leaving behind a path of destruction and devastation among millions of residents across the Gulf Coast. According to CBS News on Monday, the Category 4 hurricane has caused a death toll of 63 and may continue to grow as search efforts progress. Last Thursday, ABC News reported that Harvey has destroyed an estimate of 30,000 to 40,000 homes. In addition, about 15,000 calls for assistance have been made to the Houston Fire Department and more than 1,000 rescue related calls per hour to the United States Coast Guard. 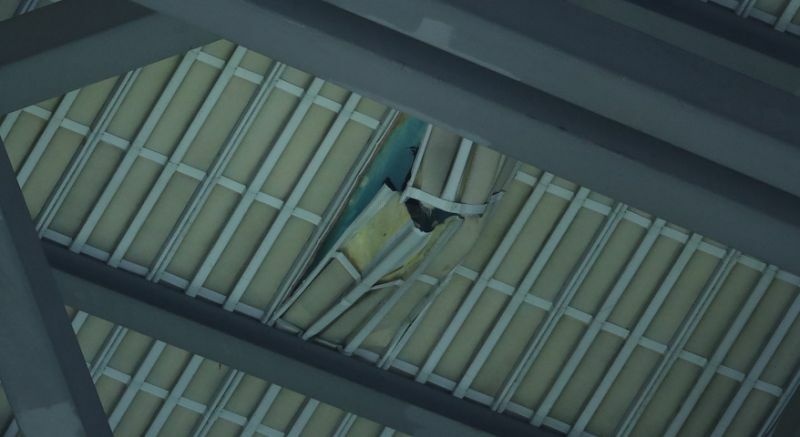 Houston’s theater district experienced massive damage and flooding prior to fall performance season planned for next week, Live Design reported on Wednesday. In response, the New York broadway community will present B'way❤Houston: A Concert To Rebuild Houston's Downtown Theater District on October 9 at New York's Midtown Manhattan’s The Green Room 42 at Yotel, Playbill.com announced on Tuesday. One hundred percent of the proceeds will go to repair efforts at the Houston Theater District. For those who cannot attend, the event will stream live with an online link to donate. Ticket prices begin at $100. You may purchase tickets here. Hosted by Seth Rudetsky, the lineup presents big names from Broadway in order to provide aid for the Houston Theater District's recovery. 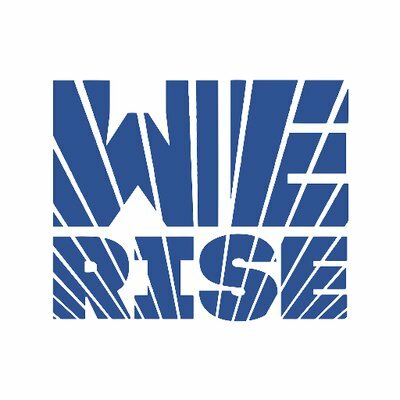 The lineup includes the following: Ali Stroker, Jessie Mueller, Nikki M. James, Andy Karl, Orfeh, Tony Yazbeck, and more, listed on Playbill.com. High water levels damaged the front of the theater due to a low level. In addition, water surged onto the Brown Theater stage through the back of the house. Fortunately the Cullen Theater stage experienced little damage but unfortunately the building’s basement is full of water. The rehearsal room which is located in the basement, experienced the worst damage and currently contains standing water. 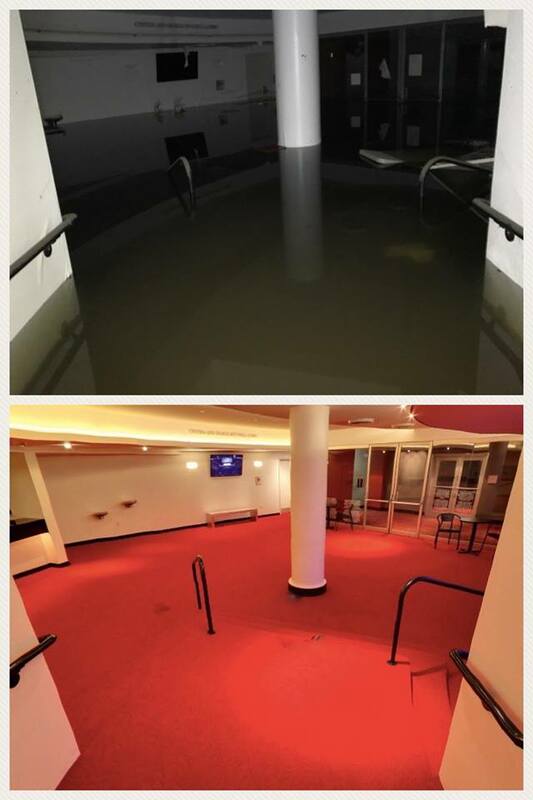 The good news: lobby areas and Hubbard Theater are both in good condition; the bad news: The Neuhaus Theater, lobby and electrical systems are fully submerged. The loading dock area of the foyer in Zilkha Hall experienced some water penetration. In addition to these buildings, the district’s garages are completely submerged underwater. However, this is not the first time Houston’s Theater District has experienced substantial flood damages. Although Tropical Storm Allison in June 2011 was not considered a hurricane, the storm trapped tremendous amounts of water, the The Washington Post recalls in an article that compares Harvey to Allison. In September 2011, Houston Chronicle reported that Jones Hall, Wortham Theater Center and the theater garages cost the city more than $27 million, with more than $7 million spent on the Alley Theater. The 250 million gallons of water took 50 days to pump out of all the garages. After that, workers pulled out 150 vehicles and worked a vigorous two months for seven days a week. Short after, the both the district and the garages opened up to the public again. Back then, individuals had proposed building a wall against Buffalo Bayou or establishing heavy doors as a tunnel system closure to prevent the flow of water. Unfortunately more than a decade later, the theater could not prevent such a catastrophic storm such as Harvey. For now, the broadway community is stepping above and beyond to support each other in a crucial time in need. Today's the last day to enter Airbnb's Total Eclipse Giveaway! According to NASA, on August 21, 2017, North America will see an eclipse of the sun. Anyone lucky enough to fall within the Path of Totality will see a total solar eclipse, where the moon completely covers the sun for approximately two minutes and forty seconds. The Path of Totality covers the following 14 states: Oregon, Idaho, Wyoming, Montana, Nebraska, Iowa, Kansas, Missouri, Illinois, Kentucky, Tennessee, Georgia, North Carolina and South Carolina. The last time a total eclipse has occurred in the United States was in 1979. Freightwaves.com reported that the eclipse may cause potential dangers for all Americans on the road involving distracted drivers and a total eclipse of the road, causing people to pull over on dangerous shoulders. In fact, the Federal Highway Administration released a fact sheet that says 200 million people, or a little less than ⅔ of the country, live within the Path of Totality. They also advise that August 21 is not the day to schedule work zones and detours. Click here for a list of driving safety tips during the eclipse. According to KGW, more than 100 festivals and events will take place in several cities across the country before and after the day of the eclipse. Keep in mind, the eclipse will only last two minutes and forty seconds. That doesn’t stop these towns from throwing some serious parties. Oregon is the very first state to view the total eclipse. The Oregon SolarFest in Madres is a four-day festival to celebrate. The small town’s 325 hotel rooms and 5,000 campsites have been fully booked for over two years. Oregon’s Willamette University will hold a viewing party with American Astronomical Society scientists who are willing to answer one-on-one questions. Jefferson, Missouri is holding a three-day festival including pub crawls, fun runs, street parties and BBQs. SolFest 2017 in Nebraska will celebrate with food, drinks and various forms of entertainment. The Amelia Earhart Airport in Kansas even offers plane rides at their Eclipse Air Fest. First Tennessee Park will boast science demonstrations and performances by the Nashville Symphony. South Carolina, is the last state to view the eclipse, with viewing parties in Charleston museums, and wrapping it up with a DJ beach blowout on the Isle of Palms. Just when you thought it couldn’t get any more ridiculous, Krispy Kreme is offering a first-time-ever chocolate glazed eclipse-themed donut. This tasty treat is available from August 19 to August 21. Hurry up and enter before 11:59pm tonight (8/10), for a chance to win the ultimate experience for two in a geodesic dome situated in the Oregon wilderness. The trip includes boarding a private jet to view the eclipse above the clouds. One day prior to the eclipse, two lucky winners will dwell in a geodesic dome near Smith Rock. The dome will be furnished with several telescopes on the observation deck. Hosted by Dr. Jedidah Isler, a National Geographic Explorer and international scholar, you will spend dinner under the stars and ask her any questions about outer space. You will also have a chance to meet Babak Tafreshi, a National Geographic photographer and science journalist, who will teach proper skills on photographing the sky. The next morning, you’ll launch into the sky on a private jet and fly along the Path of Totality, being one of the very first people to view the eclipse of a lifetime. Returning to work after a weekend of fun is always tough, especially during the summertime. Segerstrom Center for the Arts in Costa Mesa, CA, has you covered with easing the Monday blues by opening their lawn to the public for free Movie Mondays through August 7. The public may set up their chairs and blankets on the lawn at 5:30 p.m. before the movie begins around 8 p.m. You can locate the center’s map here. You may bring snacks, or pick from various food trucks on-site. This Monday’s trucks include Richeeze Grilled Cheese Truck, Ninjas with Appetite, and Chunk-n-Chip. Segerstrom Center of the Arts is a 14-acre campus that both enlightens and unites the community with inspiring performances and artistic education. The center offers various theatre camps and classes, including Summer at the Center’s camp to empower high-risk high school students, and even a new dance and music school for children with disabilities. Segerstrom Center for the Arts has a reputation for giving back to the community, and Movie Mondays is only a fraction of its selfless actions. For more information, visit https://www.scfta.org/MovieMondays . Summer is officially here and what better way to fill up your social calendar than with the top anticipated concerts and tours of the season. Some big names are getting back on the road after being on a hiatus, while other artists are dropping new music with a scheduled tour on the way. Regardless of what your music tastes are, there’s a live show for everyone. Calling all gamers! It’s that time of year again, and the E3 Expo (Electronic Entertainment Expo) is bigger and better than ever before. For those of you that have been living under a rock for the last 22 years, E3 is the world’s biggest conference event for computer, video, and mobile games. Companies from around the world showcase their groundbreaking products and technologies to the public on even bigger stages.